Eclipso is another one of those great DC villains in that he works well as an antagonist for just about any character that you pit him against. Heck, he even works when he is battling himself, as his Bruce Gordon side tries to hold back the evil that he has within. I'm surprised that we have not seen a live action version in one form or another yet. @Ross: maybe he'll be the Chief Bad Guy for next year's Arrowverse crossover on the CW. If Legends of Tomorrow makes it to next year, I'd say that would be the perfect place for him, as the Black Diamond is one of the things they could be sent after, and the best Eclipso stories are when he turns part of a team against the others. Long-time Eclipso fan here. Glad to see him make the grade or one of your covers. And he has gone up against most of DC's "biggies" at one time or another. I hadn't really thought about it, but you're right, Ross; Eclipso would be a very interesting foe for just about any live-action DC hero or team. Our Anonymous friend above either has forgotten or isn't aware that next year's Arrowverse crossover is Crisis on Infinite Earths; still, he could be a Plot Complication, and I agree with Jay that the Legends would be a good group to have to deal with him. The Titans or the Doom Patrol might be possible as well, and keeping with Jay's basic story idea. As for today's cover, only the difference in Kirby's and Gibbons' drawing styles make this not look like a unit piece. In particular, nice recoloring job on Reed's face. Eclipso VS Moon Knight The Fist of Konshu (Gesundheit!) & The Original Moon Dragon, her Dad Drax The Destroyer, and The Marvel Version of You Wanted The Best You Got The Best.... KISS! Bob G: "In particular, nice recoloring job on Reed's face." That was my first thought, too! Then, I was trying to remember which early Kirby cover this was from, because it just seemed odd. Had to look it up. FF#10. Didn't just color the face, but flipped Reed L-R but not the (4) of course. I've noticed our host is rarely one to take the cheap-and-easy route. Okay, a rare suggestion from me. Looking at that FF#10 cover that has Stan & Jack shown, I thought... They appeared in the story, it says. They also appeared, hilariouisly, in the Reed & Sue Wedding Annual (can't recall- were they shown from the back only? ), and in action in the What If the Bullpen had become the FF. Ditko was in, IIRC, a Spidey Annual. Then there was that annual Flash-multi-earth-crossover issue where, instead of crossing to E2, he went to the earth where he met the DC comics creators telling his stories. Giordano, maybe? I don't know of any other DC creators appearing in-story. Surely Julie Schwartz was in some comic!! So you see my suggestion, surely? Creators Crossover! 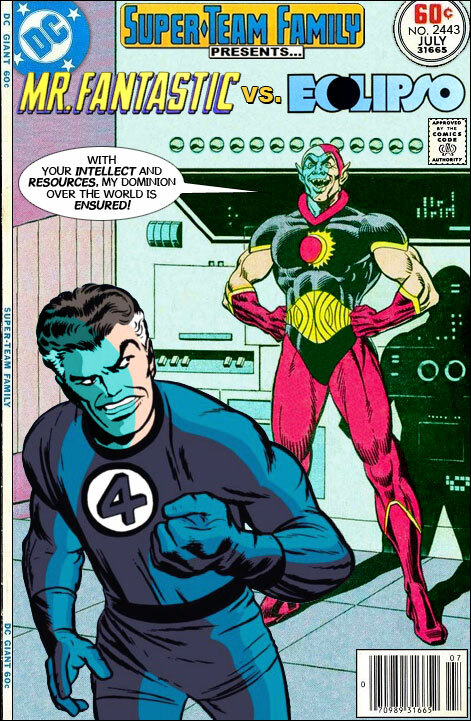 Kirby vs Giordano. Whatever you could find good enough clips for! @Bob & Anonymous: you're both right. A CW version of COIE is coming this spring. But, that doesn't mean Eclipso might not be one of the super-villains faced in one of the sub-plots. Like, for example, the Red Sky Effect could cause a lunar eclipse that brings out Bruce Gordon's version of Mr. Hyde, via his "lucky" birthstone, while he's (conveniently) visiting the National City Observatory! Enter Supergirl to stop him. Well, for creators on the cover, take a look at Cary Bates, who appeared working with the Flash on more than one occasion. @Simreeve: I am. In fact, I think the story was called "The Flash: Fact or Fiction?". And the two-parter with Cary Bates was not only a sequel to it. But, Cary's on-page avatar also referenced it! There are 2 sides to Every Schwartz. May The Orange Julius Schwartz Be With You! Hey DUUUUUUDE! Salute Your Schwartz. If Julius Schwartz had started a law firm with Samantha Eggar, they would have been... Schwartz n' Eggar! I'll be back...to sue you for nomenclatural infringement! Robo Force in: "Rise of the Rival Robo Force!"